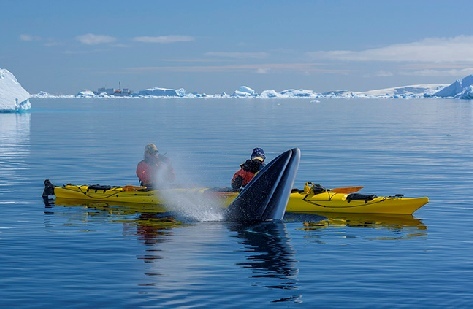 Over the four weeks of the two trips encounters with whales happened almost every day. 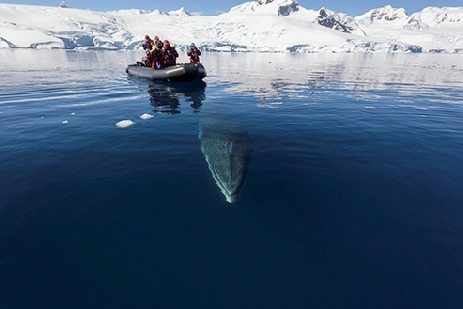 In the open ocean and closer in to the Antarctic continent we came across fin whales especially - some days huge numbers. 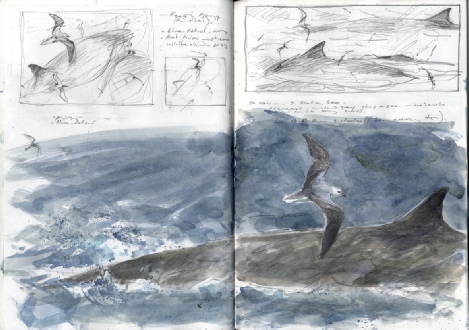 One morning there were perhaps 18 - 20 feeding, packed quite close and travelling in the same direction heaving at the surface through heavy seas their huge blows streaking downwind. 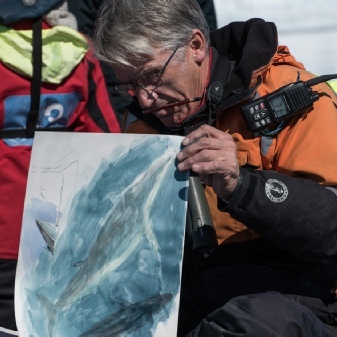 All the while around the leviathans were steams of prions and petrels and there were other groups of birds gathering in rafts to feed on the spillage left in the whales’ wake. The number of whales grew until it seemed every horizon was alive with blows and at the end of an hour or more there were reckoned to be over 100 whales in all. 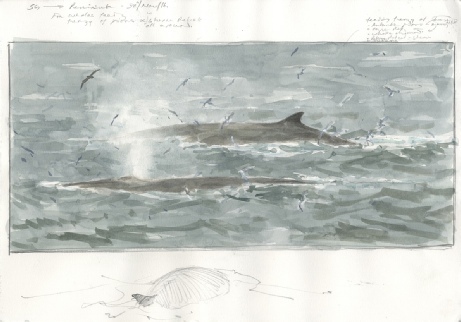 Every so often the more pronounced sickle-shaped dorsal fin of sei whales swept through the throng of fin whales. And for a long moment the enormous sweep of a blue whale’s back rolled through the ocean before the tiny tell-tale dorsal fin swept into view and was gone just as quickly. (Above). A white-headed petrel passing a group of fin whales. What was visually exciting about this particular joint encounter of mammal and bird were the harmonies in colour and form. 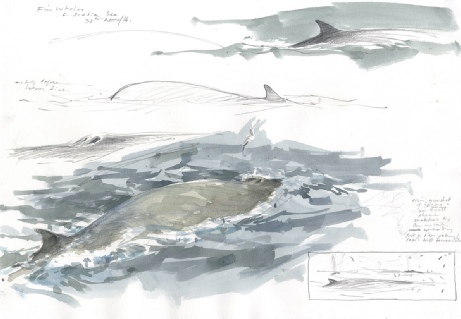 The characteristic dark angular arrow pattern across the wings and back of the pterodroma petrel mirrored the dorsal fin of the razorback* whale. 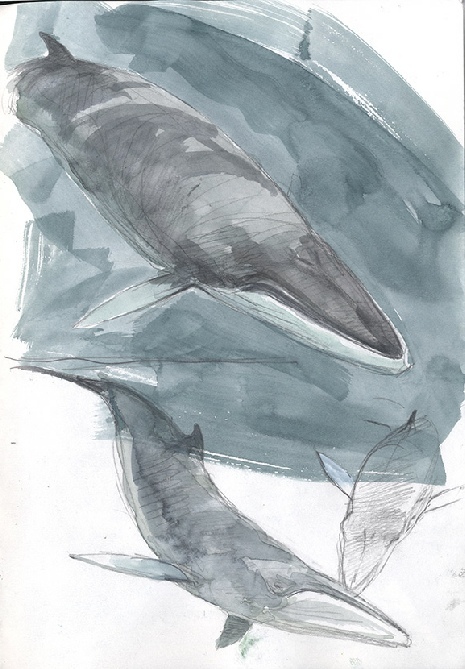 Another day - this time in Curtiss Bay on the Antarctic Peninsula - there was an extraordinary encounter with Antarctic minke whale. It was brilliantly clear with absolutely no breath of wind to ripple the crystal clear water. 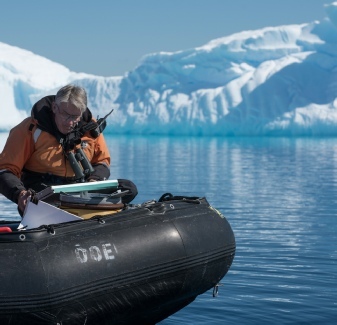 All around there was loose sea-ice with larger icebergs and we were out gently cruising around in boats - most in zodiacs and some in kayaks. 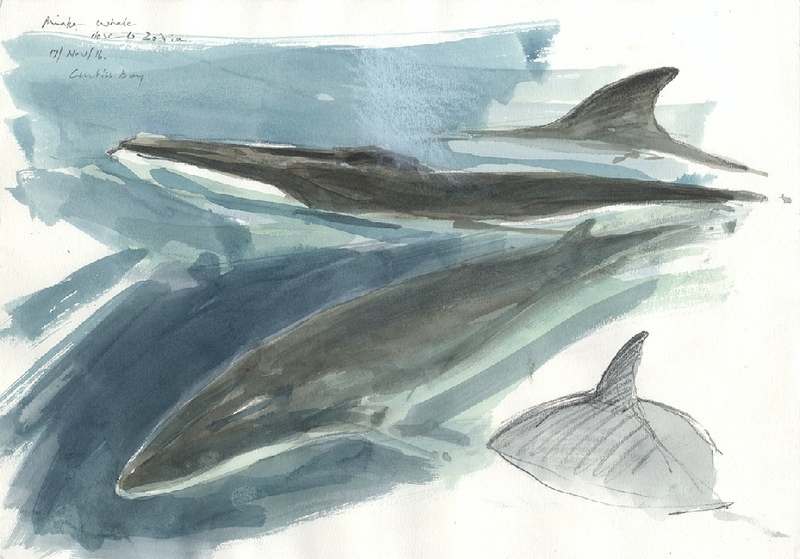 A minke whale was seen and there was an excited drift towards it, but soon engines were cut and the paddlers fell idle as the whale seemed to turn and head slowly towards us. 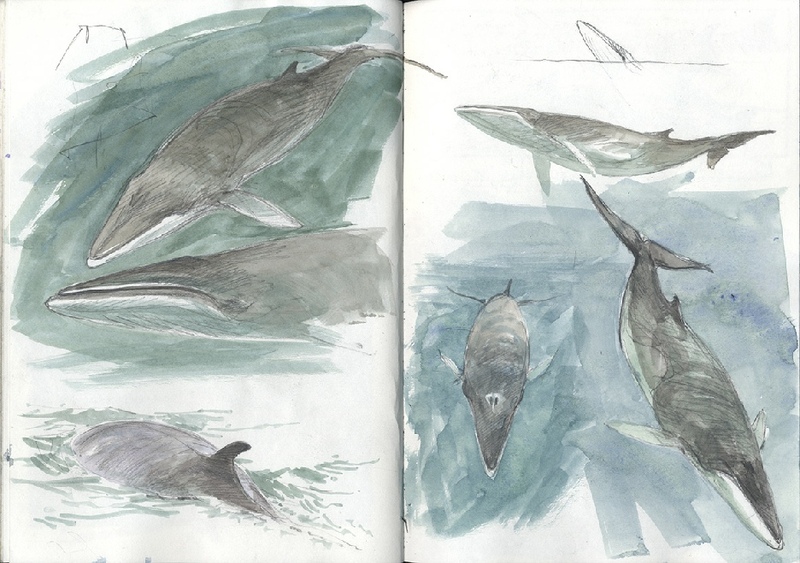 Within minutes the Antarctic minke whale was all around the boats, drifting and rolling underneath us, coming up and blowing alongside and rising up with head clear of the water ‘spyhopping’ to get a look at us. With the clarity of the water every movement and nuance of the animal’s form and gentle movements were clearly visible.